Traditional Chinese Medicine seeks to restore balance within the body, mind and environment. Garden Acupuncture uses Whole-Systems Traditional Chinese Medicine (WS-TCM) to restore balance and health not only within individuals, but within our greater Brooklyn, New York community. Through acupuncture, herbs, nutrition and lifestyle support, we empower our clients to understand, improve and maintain holistic health. We welcome all, and we’re open 7 days a week (Mon-Thurs, 11am-10pm and Fri-Sun 11am-6pm). To make an appointment, call us at 347.987.4399 or visit our booking page. Partners in business and in life, co-founders Alex Goldberg & Lisa Metzger have been practicing WS-TCM in their Park Slope location on Union Street since 2009. Officially establishing Garden Acupuncture in 2010, they continue to have the shared vision of offering high quality, authentic Whole System-Traditional Chinese Medicine to their Brooklyn community. Our team has since expanded to include Dr. Jeffrey Winsauer (PhD, OMD, LAc) and Denise Bradbie (LAc), who bring combined expert level experience in genetics, infertility, women’s health and various approaches to integrative medicine. Each of our practitioners is devoted to treating people with empathy, care and a commitment to whole-systems healing. Garden Acupuncture’s vision is a reality, offering accessible care and support to clients, local businesses and positive organizations. By making this ancient wisdom easily available through convenient hours and participation in insurance, you have direct access to their team with over 50+ years of combined clinical experience. Shared in one-on-one, personalized visits, there are advantages to personal care in a private tranquil setting vs a big clinic. Having had the privilege of touching the lives of so many and being humbled by the success of their patients, the whole team at Garden Acupuncture is dedicated & excited to be of service to you. Alex Goldberg began his studies of Psychology at The Ohio State University and continued his education earning a Masters in Acupuncture from the American Institute of Alternative Medicine. Alex also earned a Masters in Chinese Herbology from Pacific College of Oriental Medicine and is certified by the National Certification Commission for Acupuncture and Oriental Medicine. Alex co-founded Garden Acupuncture in New York with his partner Lisa. He has continued his studies of Reproductive System Health & Fertility under Dr. Randine Lewis PhD, author of The Infertility Cure and a member of the CEFP (Clinical Excellence in Fertility Professionals). After earning a Bachelors in Psychology from Ohio University, Lisa Metzger obtained a Masters in Acupuncture from the American Institute of Alternative Medicine and completed an internship at Guang An Men Teaching Hospital in Beijing, China. A co-founder of Garden Acupuncture, Lisa is certified by the National Certification Commission for Acupuncture and Oriental Medicine (NCCAOM), and her further studies include asthma, allergies and nutritional therapy training under Paul Pitchford, author of Healing with Whole Foods. Dr. Jeffrey Winsauer (PhD, OMD, LAc) completed both a Mandarin-language Traditional Chinese Medicine PhD and an OMD degree at the Guangzhou TCM University. He is also certified by the National Certification Commission for Acupuncture and Oriental Medicine. Dr. Jeffrey Winsauer pioneered acupuncture at Mayo Clinic Rochester, was appointed guest medical professor at Sun Yat-sen Zhongshan Medical School, and completed a residency in GYN & Infertility at the Shenzhen TCM Hospital. His extensive training in the U.S. and China has led to a deep & complex understanding of WS-TCM treatments for reproductive system health conditions. Denise Bradbie (LAc) studied psychology and genetic engineering at Southern Illinois University before working on the Human Genome Project at Washington University in St. Louis. At Tri-State College of Acupuncture in Manhattan, she practiced Traditional Chinese Medicine as well as French and Japanese Acupuncture. She also specializes in Craniosacral Therapy, Tui Na and TCM for Pediatric Oncology support, which she studied at New York Presbyterian Hospital. With years of experience as a medical assistant and Home Health Aide as well as formal schooling in business administration, Meera David brings the utmost professionalism and kindness to our clients. Meera handles information, inquiries and scheduling, ensuring that the process is stress-free and peaceful as possible. She is our Management Master, Happiness Advocate, Facilitator of Positive Experiences and Organizational Ninja — all in one. Four years in the hospitality industry, actively studying Business Administration & pursuing a career in the health & wellness space, Eden is instrumental in maintaining a stress-free customer service experience. 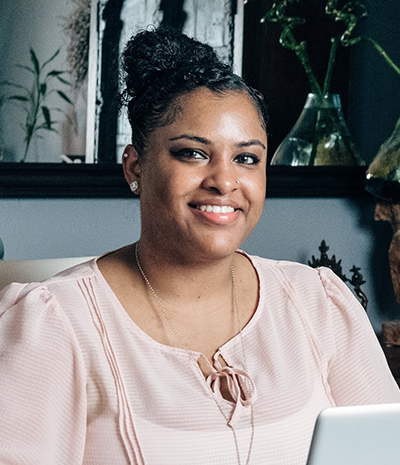 As part of the Garden Acupuncture team for three years, Eden is well versed in the workings of the office - all aspects of scheduling, insurance benefit eligibility and the go-to for your inquiries and requests. Having studied visual art and continuing a practice of painting and drawing, you may just catch a glimpse of Eden's creativity on our outside chalkboard. We frequently work with physicians and other healthcare providers to integrate conventional and whole-systems medicine. Relief and recovery require a collaborative approach—our network brings together specialists and sources with different skills to help clients achieve the best possible results.